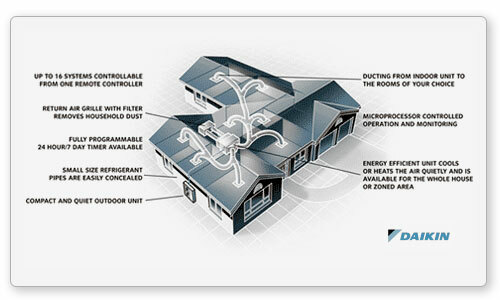 Ducted refrigerated systems consist of an indoor and outdoor unit. The indoor unit, usually located in the ceiling, is connected to flexible ductwork that distributes conditioned air through strategically positioned outlets placed throughout the home. The indoor and outdoor units are connected by pipes carrying refrigerant. With refrigerated ducted air-conditioning it is imperative that all external door and windows be closed to maximize the efficiency and effectiveness of its operation.